Frankie Fife, shown with Mike Reed, was chosen as the Edward Jones Investments Athlete of the Month for February for Greeneview High School. This award is being sponsored by the office of Mike Reed at Edward Jones Investments of Xenia, serving Xenia, Jamestown, Cedarville and surrounding areas. Fife, a senior on the girls basketball team, averaged 17.7 points, 4.6 rebounds, 5.3 assists and 4.3 steals per game, connected on 47.5 percent of her shots from the floor, and joined the 1,000 point club (second in career points in school history). She also helped lead the team to the Ohio Heritage Conference South championship, was named first team OHC, and to the All-Southwest District team. 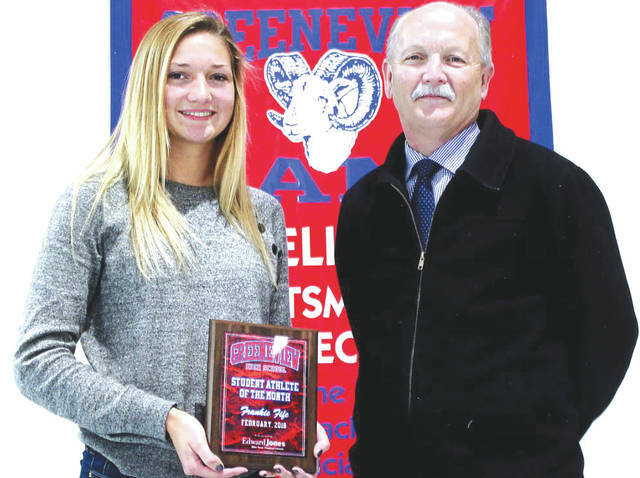 Her grade-point average is an impressive 4.09.
https://www.fairborndailyherald.com/wp-content/uploads/sites/50/2018/04/web1_FrankieFife_PS.jpgFrankie Fife, shown with Mike Reed, was chosen as the Edward Jones Investments Athlete of the Month for February for Greeneview High School. This award is being sponsored by the office of Mike Reed at Edward Jones Investments of Xenia, serving Xenia, Jamestown, Cedarville and surrounding areas. Fife, a senior on the girls basketball team, averaged 17.7 points, 4.6 rebounds, 5.3 assists and 4.3 steals per game, connected on 47.5 percent of her shots from the floor, and joined the 1,000 point club (second in career points in school history). She also helped lead the team to the Ohio Heritage Conference South championship, was named first team OHC, and to the All-Southwest District team. Her grade-point average is an impressive 4.09. Photo by Ron Lea.